Mother Teresa, Angel of Mercy 1910- 1997. One of the greatest saints of out time. She founded an order of nuns in Calcutta, India to serve the poor. Hers was a Jesus-centered life. Her words offer a lifetime of inspiration, hope and guidance in this Counted Cross-Stitch design licensed by Corbis.com and adapted by Sandy Orton. 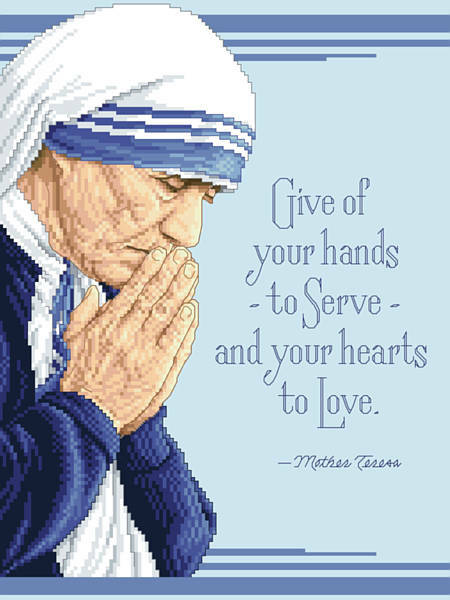 They read: "Give of your hands - to Serve - and your hearts to Love,"